You are at:Home»News»New Ships»Unveiling Norwegian Escape’s Most Fabulous Features! Unveiling Norwegian Escape’s Most Fabulous Features! 2014 was a big year for Norwegian, with the Miami based cruise line picking up a profusion of industry awards. 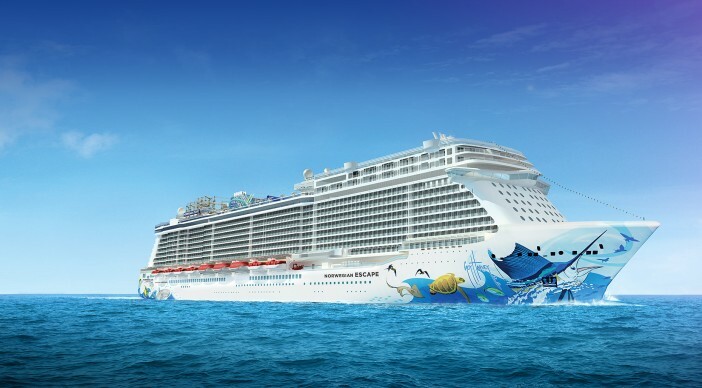 2015 is set to be even bigger as the line gets ready to launch Norwegian Escape, its newest fleet member with the capacity to host a huge 4,248 passengers! While her maiden voyage isn’t until October 2015 we’ve got the scoop on some of the most exciting new features set to hit the decks of the 164,600 tonne super ship. From fine dining and five star digs to pampering and childcare, there’s something for every cruiser. As seen on several of its fellow fleet members The Haven by Norwegian will also make an appearance on the line’s latest vessel. The Norwegian Escape will offer passengers a choice of 95 deluxe suite style accommodation options boasting some spectacular features. Think a private restaurant, outdoor courtyard area, spa treatment rooms, whirlpool spas and sundeck reserved exclusively for Haven passengers. Not to mention linen from The Bliss Collection, in-suite coffee machines and personal concierge service. A much awaited at-sea first! What’s really got the industry talking is the construction of Norwegian Escape’s quarter mile long oceanfront promenade lined with a huge range of restaurants and bars. Passengers will be spoilt for choice! One of the coolest features set to grace Norwegian Escape is the reinvented Tobacco Road Bar. After 102 years quenching the thirst of Miami punters the nostalgic bar is switching to an at-sea location! Drinkers will be able to enjoy some fabulous original quirks including memorabilia, old photographs and the bar’s genuine neon sign. Expert mixologist Leo Holtzman will be fashioning all the usual favourites including Chili Mules and Gateways. Joining the Tobacco Road Bar is Jimmy Buffet’s novelty Margaritaville restaurant and the laid back 5 O’clock Somewhere Bar. For cruisers that like to get their gamble on the sleek and stylish Skyline Bar is a must visit venue. Plus it’s the largest casino across the entire Norwegian fleet! Celebrity chef Jose Garces is gearing up to tantalise the taste buds of Norwegian Escape goers with a Spanish themed fine dining venue accompanied by a gourmet tapas bar. Paying tribute to the sounds of the legendary Duke Ellington, Broadway’s ‘After Midnight’ has been confirmed as Norwegian Escape’s official on-board production. ‘Million Dollar Quartet’ will also hit the stage, a toe tapping show celebrating the night when Elvis, Johnny Cash, Jerry Lee Lewis and Carl Perkins famously took part in a Memphis recording session. After dark passengers can glam up and hit the 80s themed supper club which will host a live cabaret show packed full of the decade’s greatest tunes. When passengers start to feel the heat of the dazzling Caribbean sunshine they’re invited to cool off in the world’s very first at-sea snow room! While Norwegian has catered to older kids in the past Norwegian Escape will be the first ship to run a programme tailored to toddlers aged two and under. It’s the perfect opportunity for parents to indulge in a little down time! Love to get the adrenalin pumping? Norwegian Escape’s ropes course will be spread across not one, not two but three stories! It’s set to be a clear-cut favourite with kids and adults alike! After inaugural sailings from Southampton, the ship repositions to Miami where it will offer seven-night trips to the Eastern Caribbean. This means that passengers will get to enjoy all of the above features while soaking up the rays of Tortola, St Thomas, Nassau and beyond! Want in on the action? You can snap up great deals on all Norwegian Cruise Line itineraries at Cruise 1st.